My Tau army is finished. All 1750pts of it! 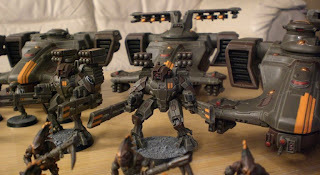 Of course I'll share my 1750pts Tau army list with you. 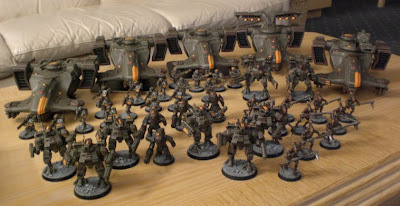 It would be rude not to and as promised, I'll let you know how my Tau army gets on at the 1750pts Carnage tournament. The biggest change to the tournament rules pack, which I have only just read, is the change to objectives. Objectives are now worth 100pts. And that boys and girls, means that the aim of the game is KILLING and lots of it. Suddenly I feel a lot more confident about fielding a Tau army that typically struggles to take objectives, but excels at blowing the opposition away. I only just finished painting the orange stripes on my remaining Tau tanks a few minutes ago, then glued the rest of the tank components together. I've had to take some photos of my 1750pts Tau army today instead of at the tournament. My folks have gone away for the week and taken all of the camera batteries with them as well as the charger. Obviously, that doesn't help me when my camera battery is flickering red. But I'll hunt down whoever is taking photos over the weekend and get a copy for the blog. Tau battle reports from the tournament will be up on Friday. Wish me luck as I take the 'Stripey Brigade' to their second tournament! I like the total army man it looks sharp and extremely well painted. Hope you enjoy it man. Good luck on the tournament I never really knew your complete army list. I can see why you have trouble keeping objectives with your troops. Be sure to claim objective while in the Devilfish (makes it a lot harder to get you off the objectives. anyways have fun and be sure to let us know how it all went! Great work, I'm currently working on my Tau army as well. Allthough i don't have a list I'm working towards. I'm just painting everything that is Tau I currently have. Dude that looks awesome, an inspiration to Tau players everywhere. Go get em for the Greater Good! I've just about to finish my cadre soon, no deadline for me tho, hehe. Be sure to put up a nice report after that. how did the tournament go where all getting curious if you won a painting award! and how did the 6 man Fire warriors handle all the missions? Yes! I had visited your blog (from your ATT sig) just as it was getting off the ground. I remembered you had great looking models, but for the life of me I couldn't remember the site! So, I'm glad I found it again.